Handwritten notes by Stanley Kubrick from his early development of the screenplay for The Shining. His notes describe an encounter between Jack and Wendy, where Wendy injures Jack in an attempt to defend herself. 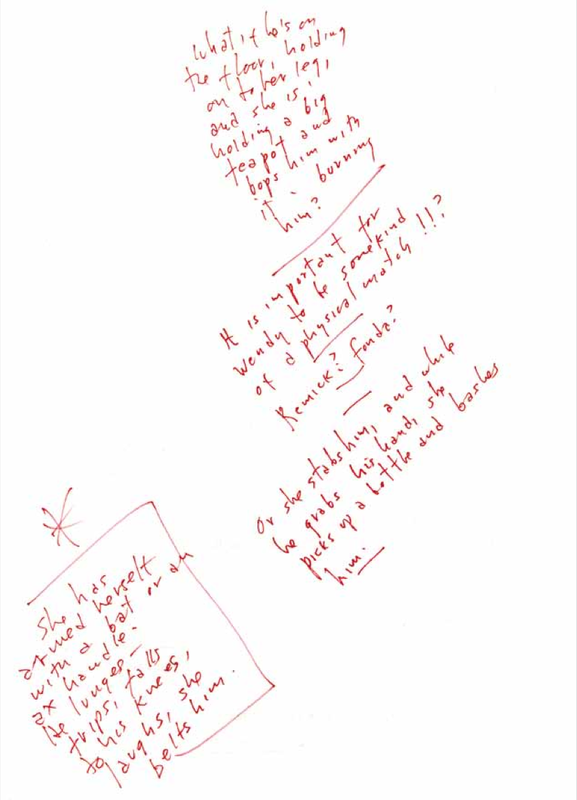 In his distinctive scrawl, Kubrick toys with different ways in which Wendy might injure Jack. These musings ultimately led to the scene in the finished film where Wendy strikes Jack with a baseball bat on the stairs of the Colorado Lounge. Kubrick also considers that Wendy may need to be a physical match for Jack, speculating that actors Lee Remick or Jane Fonda might be possibilities for the role.